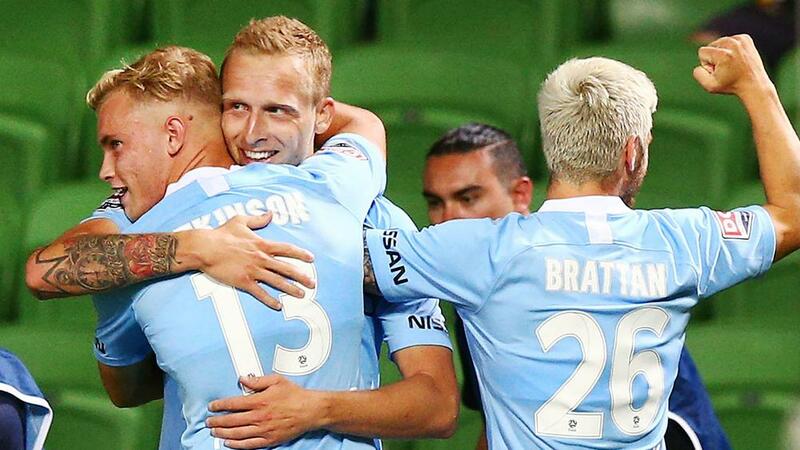 Ritchie de Laet's deployment as an emergency striker paid off for Melbourne City on Friday as his well-taken goal earned a 1-0 A-League win over Brisbane Roar. City boss Warren Joyce is working with limited forward options as regular starter Bruno Fornaroli continues to be left out in the cold following a reported row with the head coach. Rumours this week suggested City and Perth Glory could agree a swap deal involving Fornaroli and Andy Keogh but the temporary solution of selecting right-back De Laet as a lone frontman paid dividends at AAMI Park against the beleaguered Roar. After visiting goalkeeper Jamie Young had twice denied Lachlan Wales in the first half and then superbly tipped over Scott Jamieson's curling effort early in the second, De Laet struck in the 52nd minute. Rostyn Griffiths delivered a cross from the right and De Laet showed the finishing touch of a seasoned forward to sweep home first time beyond Young for his second goal in three games. Roar piled on the pressure in the closing stages - Nicholas D'Agostino forcing a fine stop from Eugene Galekovic before Eric Bautheac blazed the rebound wide four minutes from time - but an inability to find an equaliser meant Brisbane's sorry run stands at just one point taken from eight games. City, meanwhile, have won four and drawn one of their past five outings to move level with Melbourne Victory and Sydney FC in a three-way tie for second, six points adrift of leaders Perth.